The people of Beira, Mozambique, need food. In some remote areas, which aren't easily accessible to aid workers, residents are forced to fight each other for something to eat. In a video filmed on Sunday, people living in the district of Nhamatanda are seen scuffling over loaves of bread. Bread, or pão, can cost anything from 6 to 15 Mozambican metical (R 1.40 - R 4.00). One local told News24 the men distributing the bread from the back of a van were "popular entertainers" from Beira's CBD. Nhamatanda is a rural town, roughly 100km from the city centre. Access to food and clean water continue to be a problem. The people here are heavily reliant on subsistence farming. Locals usually farm maize, potatoes and rice. When Cyclone Idai hit the shores of Mozambique, Zimbabwe and Malawi on Thursday evening, it destroyed everything in its wake. 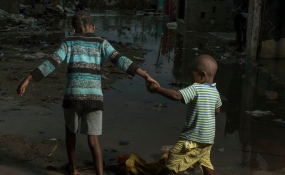 Beira, which is one of Mozambique's largest cities, received the lion's share of the devastation. Cast iron billboards advertising multi-national brands such as Coca-Cola were bent and lay strewn on the port city's pavements. Trees were toppled, and homes flattened. During a media briefing on Saturday the Minister of Land and Environment, Celso Correia, said the death toll was now 417, but the number is expected to increase.